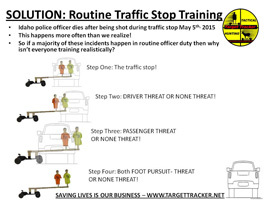 To assist the Law Enforcement and Military communities by providing versatile and capable low cost solutions for Law Enforcement and Military Personnel with an emphasis in Tactical Training, Developing solutions and improved methods for saving lives and combating terrorism. Wayne McGregor, a nationally recognized tactical training professional, hunting celebrity and wildlife forage food-management expert, formed HuntingWildlife.net LLC (HWN) video productions in 2000. McGregor and his company are a recognized expertise-leader in Hunting Entertainment Services, Marketing and the Tactical Enforcement Training community. In November 2010, McGregor was introduced to a Product as Target Tracker to produce promotional videos for their forthcoming mobile targeting device. He quickly realized TTL's approach to market research, product development, and commercialization was very fragmented and lacked the necessary corporate governance and capital to succeed. 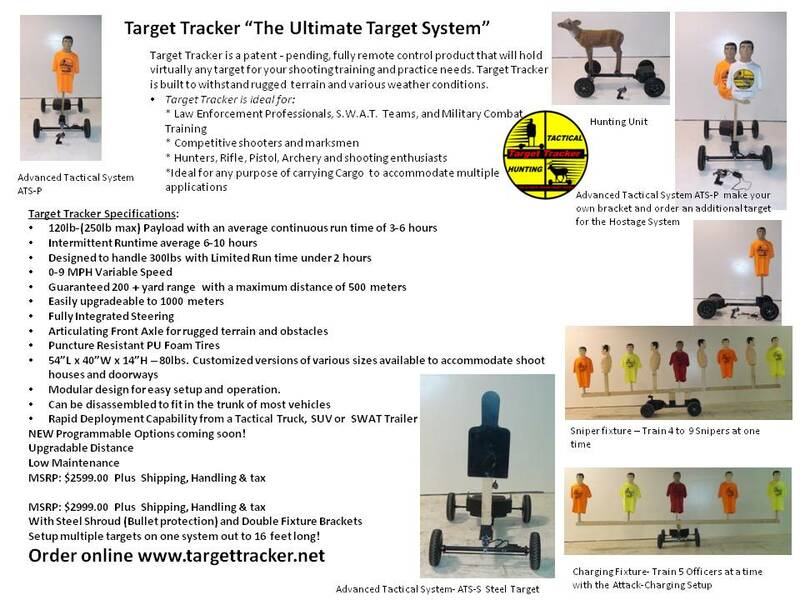 Target Tracker products to promote gun safety, shooting skill development, and be featured in tactical training exercises, celebrity decoy hunts, hunting retreat visits, archery and shooting competitions. The program will also thematically address how various industry problems can be easily rectified with an innovative RCEV solution and its purpose-designed accessories. In January 2011, McGregor's focus changed from working "in" the business to working "on" the business. 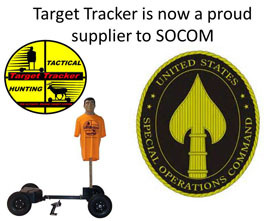 He began forming an advisory team to rationalize Target Tracker's design and marketability in the tactical military, Law Enforcement and hunting industry. This study not only resulted in re-engineering the product to reduce manufacturing cost and improve product performance, it also identified other vertical market opportunities in agriculture and event entertainment. In January of 2002, Wayne McGregor met an individual that is now known as "Target Tracker Tactical Trainer here in after Trainer. During the course of this relationship McGregor and Trainer formed an instant bond over their love and passion for the outdoors. Since Trainer has educated McGregor in the art of shooting and tactical engagement. McGregor attended a personalized training course for months during the 9 year relationship. Trainer's involvement in many missions and proven combat experience was crucial in the development of the Target Tracker Product. Trainer basic instinct is to maintain his autonomy for various reasons. Trainer passed on his experience and training education to McGregor to be the face of his training program to maintain his autonomy. Both McGregor and Trainer share a true passion to save the lives of our soldiers and law enforcement while serving the communities to provide a very advanced training program.